The year is 1927. The place is Vienna, Austria. Franziska captivates Franz with her adolescent beauty. They have separate ambitions, but they dream about them together. And just when these dreams are finally being realized, Adolf Hitler changes their course forever. The author has written a revolutionary memoir of her parents that is multifaceted in flavor and detail. First and foremost, Serenade is a love story. Secondly, it is an atypical Holocaust love story. And thirdly, it is an operatic love story that illustrates how music can raise the human spirit, save the human spirit, and give the human spirit hope. From Vienna and Prague to Cuba and the United States – Franz and Franziska are forced to flee from Adolf Hitler’s lair. The flavor of each locale can literally be tasted and inhaled by the reader. Never before has a book depicted scenes in operas in such detail and connected the operatic theatricality with historical events and a true life love story. This nonfiction memoir reads like a novel, yet it is jam-packed with data that educates. Franz’s tragedy turns out to be his savior. And the two immigrants find a taste of the American dream in the magic world of Hollywood. Although Carol Jean tells the story of her parents’ struggles and joys, her own voice shines through so that this memoir becomes a tribute from the author to her parents, which is at times poetic, and has the capacity to move those who read it. Carol Jean began by simply writing words on a page. 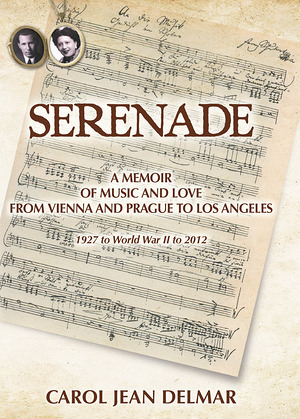 However, throughout the process of creating Serenade, she was forced to analyze her own trials in the context of her family heritage, which has enriched her life so that the book has become dear to her and taken on a life of its own, which she is happy to now share with her readers.